In this era where you can surf the web, take photos and stream music on your smartphone, it’s all about being connected. Boaters want to connect their VHF radio to a GPS, monitor their fuel consumption and see radar images on one display. Our electronics suppliers have made all of these networking tasks simpler, and our website shows a vast universe of choices. What Type of Boat Do You Have: Sailing, Cruising, Fishing? Depending on your boating style, it often makes sense to shop by brand. Simrad is oriented toward the larger powerboat, fishing vessel or sailboat. Lowrance caters to the coastal or inland fishing vessel in the small/medium size range. B&G is a sailboat-only brand, with features and software designed just for sailors. Raymarine products are original equipment on many production sailboats, and Garmin, the worldwide leader in consumer GPS navigation, began by focusing on the powerboat market. However, both of these brands offer comprehensive systems with the versatility you need, whatever your boating style. Fishfinder, Chartplotter or a Multifunction Display? Fishfinder: First choice for the inland, small boat angler, the fishfinder performs one function—showing a picture of what’s below your boat. Fishfinders do not include a GPS receiver, so they’re not navigation tools. Many, especially in the economy price range, do not network with other devices. Chartplotter: The sailor’s favorite, a chartplotter is a GPS navigator that displays high-quality marine maps onscreen, and shows your boat’s position superimposed on the chart. 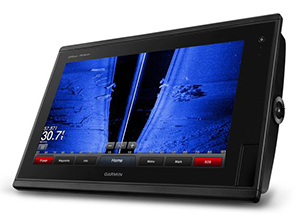 Available in many styles and price ranges, chartplotters do not include sonar (but you can often add this fishfinder capability by connecting a “black box” sonar and a transducer). At the high end of the price/performance range, chartplotters become multifunction displays (especially when they network using NMEA 2000 protocols). Fishfinder/GPS Combo: The most popular style, combo displays marry a chartplotter and fishfinder in one case, so they’re a good choice for smaller boats or vessels with limited dashboard space. They usually have a built-in internal GPS antenna, so might require connection of a remote GPS sensor when mounted below deck. Many combos, specifically those intended for the small-boat inland angler, come with a transom-mount transducer. For the rest, you can purchase a compatible thru-hull, transom-mount, in-hull or trolling motor-mount transducer separately. Multifunction Display: Occupying the high end of the size and price range, multifunction displays are made to be the hub of a large and comprehensive onboard network. Often found on bigger boats, you can place one display at the helm and another in the nav station, flybridge or tuna tower. You’ll usually purchase a separate, remote GPS antenna, black box sounder, and often the cartography of your choice, since maps are often not preloaded. Look at the Garmin GPSMAP 8500-Series displays, the Raymarine e-Series and the Simrad NSO evo2 Displays for examples of premium MFDs. Do You Want to Connect More than One Display to Show Data on Your Network? NMEA 0183: If you have marine electronics onboard that are older than a couple of years, they are probably networked using the NMEA 0183 standard. In fact, most of the chartplotters, combos and fishfinders on this site communicate using this system. Problems and complications happen when connecting devices from different manufacturers, of different ages, and when one device in the network fails. NMEA 0183 has served us reasonably well since about 1983, but as devices have become more sophisticated, newer standards have increasingly replaced it. Simple devices, like a basic fishfinder, still use 0183 as a serial data interface, even if it is not a true network. 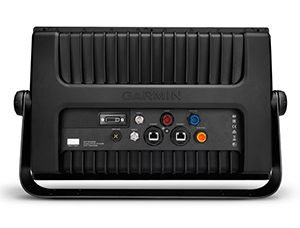 NMEA 2000: Our three primary manufacturers (Garmin, Raymarine and Navico, whose brands are Simrad, Lowrance and B&G) all provide comprehensive systems built to the newest networking protocol. NMEA 2000 allows plug-and-play connection of any product from any manufacturer, as long as they are all built to the certified specifications. The following video will help you understand how simple it is to construct your own NMEA 2000 network. 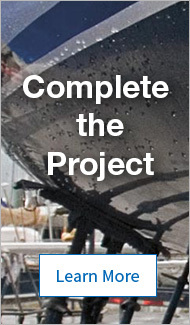 Build your own network with a Lowrance fishfinder, Simrad Broadband 3G radar, Mastervolt inverter/charger, Maretron engine monitor, laptop computer and SeaStar Solutions controls among other devices. Pick the best model of every type of device, stick them together like Tinkertoys with standardized wiring and information exchange language, and assemble your own instant plug-and-play network. With five conductors (two for data, two for power and a ground), keyed male and female ends, heavy shielding from electro-mechanical interference (EMI) and waterproof construction, the system is virtually idiot-proof. A multi-talker/multi-listener system (0183 is single-talker/multi-listener), an NMEA 2000 network can accommodate up to 50 individual devices per vessel. No single “brain” is required, and the failure of any one device won’t bring down the whole network. NMEA 2000 networks are 50 times faster than NMEA 0183 (250 kilobits/sec.). NMEA 2000 networks are backwards compatible with NMEA 0183. CAN Bus Networks: NMEA 2000 is a Controller Area Network (CAN) bus technology, developed for automotive, robotics and industrial control applications. It uses standardized “trunk” or backbone cables, tee connectors, and branch lines called “drops” or “stubs.” A similar and compatible standard, J1939, was developed by the auto industry, and is being used in new marine diesel engines. They can communicate via NMEA 2000 with an interface adapter, as can many newer Evinrude, Mercury, Suzuki and Yamaha outboards. When connected to the network, some displays show “virtual engine gauges” onscreen. Ethernet-based Networks: Raymarine, Navico, Garmin, Furuno and other manufacturers have created their own proprietary communication protocols and cables, connecting devices with high-speed Ethernet connectors. These systems have become the standard for sharing large amounts of data from radar imaging, electronic cartography and video cameras. Usually they’re installed alongside NMEA 2000 networks, which handle systems monitoring and control. Simplified drawing shows the backbone and drop cables of an NMEA 2000 network, connecting various devices and power sources. Would You Prefer a Touchscreen or a Keypad for Data Input? Keypad: The traditional push-button user interface is less expensive and easier to operate when you’re wearing gloves. Touchscreens used in smartphones, chartplotters and multi-function displays detect tiny electrical charges from your skin, but do not work as well when they are wet, in cold weather or when gloves insulate your hand. There are two types: Single-touch touchscreen and multi-touch touchscreen. Single-touch touchscreen: The majority of the touchscreen devices are of this type. You can swipe the screen and move icons around or push onscreen buttons instead of mechanical buttons. Some displays use a touchscreen combined with a few buttons and a rotary controller knob. Very slick and user-friendly. Multi-touch touchscreen: This is the interface you use on your iPhone, iPad or Android smartphone. It includes “pinch to zoom” using two fingers. 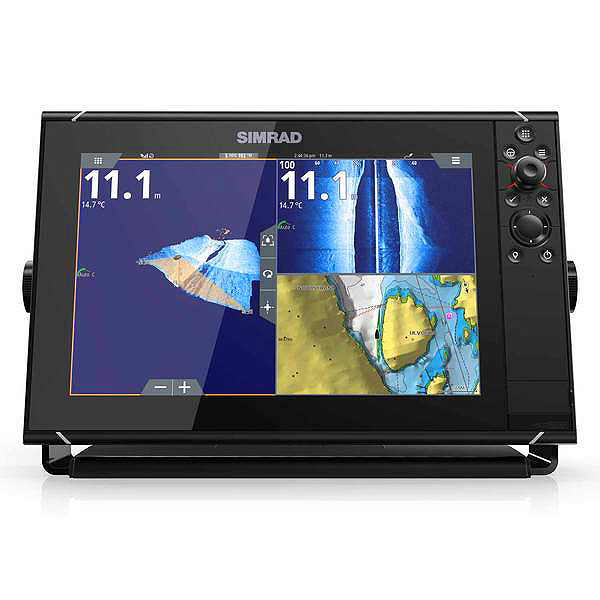 The Simrad NSS12 Evo3 Multi-function Display is a full-function network hub. Beautiful, bright SolarMAX™ display can be viewed from angles of almost 180°. It networks with all the latest radar and sonar. Is your intended use inland, coastal US, International, or some combination of these? Preloaded charts: Most navigation devices, from the most basic Garmin 64 Series Handheld Wilderness Navigators to high-end chartplotter/fishfinder combos, include a choice of preloaded maps. Most allow you to add optional maps (usually stored on a small chip such as a MicroSD card). Choose the map option that best covers your boating region, and buy additional maps if you cruise or trailer to distant waterways. You can also upgrade to higher-resolution maps with more detailed charts, and amazing added features, for example, by upgrading your Navionics-compatible chartplotter to Navionics Gold or Platinum PLUS. Finally, just about all of the displays that have “no charts” come with a worldwide basemap with minimal detail. Transducers: If you’re looking for a fishfinder/chartplotter combo, consider the selection of a transducer. Anglers who fish in deeper waters and those who prowl shallow inland lakes have many choices of frequency, beamwidth and beam configuration. Check if the transducer is included with your combo. Many fishfinder/chartplotters designed for the small boat, inland market include a transom-mount transducer. Bigger network displays usually require you to choose and purchase a transducer separately.